Crabtree Creek Greenway on the verge of linking with Umstead - GetGoing NC! “That would be really aggressive,” says Lebsock. But if it happens, the trail could possibly be done by the end of next year. Walnut Creek Trail “We completed this extension last week,” Lebsock says of the 4.5-mile extension greeenway along its namesake creek, creating a continuous trail from Rose Lane to the Neuse River Trail. The Walnut Creek Trail now runs about 12 miles, from the Neuse River Trail west to Lake Wheeler Road. Eventually, it will run through N.C. State University’s Centennial Campus and connect with Lake Johnson, a distance of 15.6 miles. Neuse River Trail Just 0.8 miles is all that remains to be finished of the 27.5-mile Neuse River Trail, the spine of the Raleigh greenway system. Raleigh’s City Council awarded a contract for this stretch in January, construction is expected to begin this spring, the missing link is expected to be finished in August, says Lebsock. Honeycutt Creek Greenway This 5.6-mile stretch will create another vital link in the Raleigh greenway system, joining the Mine Creek Greenway (and greenway extending south around Shelly Lake and to the Crabtree Creek Trail) with the Mountains-to-Sea Trail at Falls Lake. Construction began last spring, the trail is expected to be finished in July. Crabtree Creek Trail This 4.1-mile extension will join the east end of the existing Crabtree Creek Trail with the Neuse River Trail at Anderson Point Park. Trail users will then be able to run/walk/bike/skateboard 14.6 miles to Lindsay Drive, where the trail currently ends. The aforementioned extension into Umstead will result in an overall run of 17 to 18 miles, says Lebsock. 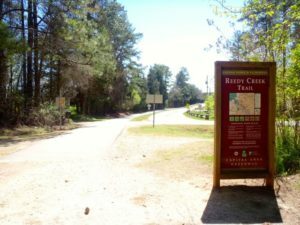 On the south side of Umstead State Park, the bike and bridle trail meets Raleigh's Reedy Creek Trail. 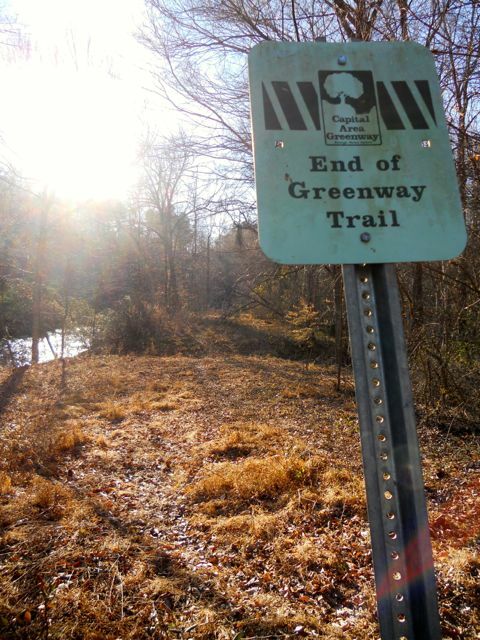 Completion of the Crabtree Creek Extension would create a continuous loop of greenway — including the Walnut Creek and Neuse River trails — of nearly 40 miles. 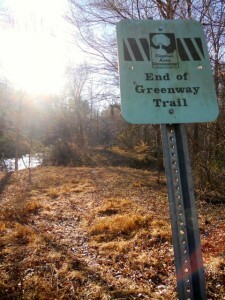 What will happen when Crabtree Creek Trail reaches Umstead? “The interesting conversation now is what to do with Umstead,” says Sig Hutchinson, current chairman of the Wake County Open Space and Parks Advisory Committee, a past president of the Triangle Greenways Council, and the Triangle’s leading greenway advocate. Umstead and its bike and bridle trail serve as a key greenway hub. To the south, the Umstead trail links with the Reedy Creek Trail and additional Raleigh greenway that run through Meredith College, N.C. State University and the Dorthea Dix property before meeting the Walnut Creek Trail. And to the west, Umstead’s bike and bridle trail links with Cary’s Black Creek Greenway, which runs 7.1 miles to Bond Park — and a connection with the White Oak Creek Greenway, which nearly links with the 20-mile American Tobacco Trail, which is one official bridge opening away from running into downtown Durham. 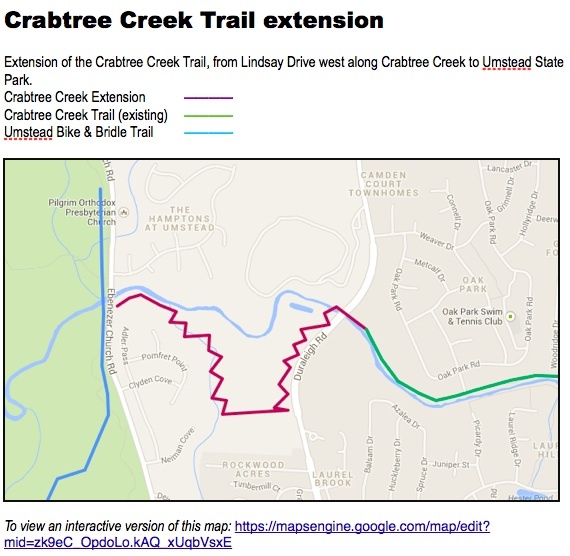 With all that work in progress, all those key links pending, it seemed reasonable to ask Lebsock if the new Crabtree Creek extension to Umstead was much of a priority. 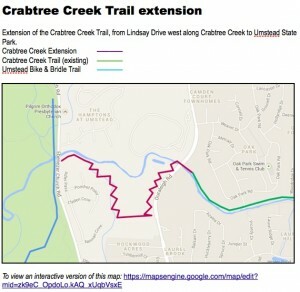 To view an interactive version of the Crabtree Creek Trail extension map, go here.